TS SI FWE/Mains Answer Key 2018| Final Written Exams Key Download @tslprb.in . TS SI FWE preliminary key and final key@ tslprb.in Telangana SI of police recruitment Mains/Final Written Examination key sheet 2018. Police Jobs,Telangana State SI/Sub Inspector of Police Posts 2018 Recruitment, Telangana State Level Police Recruitment Board has conducted the Final Written Examinations for the recruitment of SCT SIs (Civil/AR/SAR/TSSP) in Police Dept., SIs (Men) in SPF and SFOs in TS DR & Fire Services dept., and SCT SIs (Commns/PTO). The Final written Exams Answer Keys, Results, selection list/merit list details are given here. Telangana Police SI Answer Key 2018 Download TSLPRB Sub Inspector Mains Exam Cut off Marks. Telangana Police SI Mains exam Key Paper available at official website. Telangana State Level Police Recruitment Board has been conducted the TS Police SI Mains Exam at various centers across the Telangana State. The candidates who are qualified Preliminary and events qualified has been written the exam. They are now eagerly awaiting to downloading Telangana SI Mains Answer Key sheet 2018. The TSLPRB has to be released the Answer Key through official website. 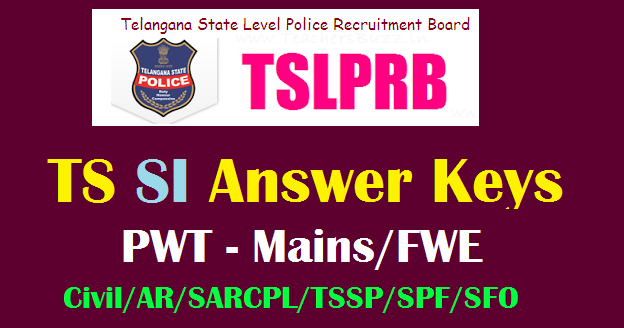 So Applicants would like download TS Sub Inspector Mains Answer key 2018 from the TSLPRB official website. Telangana State Level Police Recruitment Board, The Director General of Police, Telangana State given SI Posts 2018 recruitment notification on 6th February to fill up the vacancies. Applications are invited through from tlsprb.gov.in for recruitment of SI posts. Preliminary Written Test conducted for TSLPRB SCT SI Civil and / or Equivalent EXAM conducted on 26-08-2018 and SCT SI IT & C / ASI FPB exam conducted on 09-09-2018 . Telangana police department going to conduct physical measurement test (PMT), and physical standard test (PST) . Candidates have to complete TS SI events 2018 successfully. The successful candidates have to attend Telangana SI mains exam 2018. TS SI mains exams to be conducted by TSLRPB. Candidates who qualified in PMT,PST qualified to appear for the Final Written Examination (FWE) . Preliminary Key for PWTs Dated 9.9.18 of SCT SI IT&C and SCT ASI FPB Telangana State Level Police Recruitment Board conducted the Preliminary Written Tests with reference to the Notification issued on 31-05-2018 for the direct Recruitment of 29 vacancies of SCT Sub Inspector of Police (IT&C) and 26 vacancies of SCT Assistant Sub Inspector of Police (FPB), in and around Hyderabad City on 09-09-2018. Preliminary Key for the above Tests is now made available on the official website: www.tslprb.in from 19-09-2018 onwards. Candidates may submit Objections, if any, on Preliminary Key for each question individually in the following Web Template made available tothem in their respective Accounts latest by 5 pm on 21-09-2018, by uploading any supporting Documents / Material in pdf / jpeg format, as attachments. It is once again cautioned that every individual (question) Objection, has to be submitted separately, by mentioning the details in the above Proforma. Objections withinsufficient information will not be considered. No manual representations will be entertained in this regard. Telangana State Level Police Recruitment Board has conducted the Final Written Examinations for the recruitment of SCT SIs (Civil/AR/SAR/TSSP) in Police Dept., SIs (Men) in SPF and SFOs in TS DR & Fire Services dept., and SCT SIs (Commns/PTO).Candidates who are appeared for the Final Written Examination (FWE) from ...... can download the Answer keys from the following table. The Question Paper Booklets (codes A, B, C & D) and Preliminary Key of the Final Written Examination of SCT SI, held on ....... Fore Noon and After Noon for Arithmetic & Test of Reasoning/Mental Ability and General Studies respectively will be available at www.tslprb.in from 10.00 PM . The objections on the Preliminary Key, if any, may be uploaded on or before ...... by 11.00 AM. (2) Objections without proper justification will not be considered. (3) Objections sent by written Letters, E-mails are not acceptable. 3. A new page will be opened with answer key and clink now. 5. Now save or download the Answer Key. 6. With this Key you can estimate the marks of the examination.